Once a trusted member of Iraqi President Saddam Hussein's inner military circle, Wafiq Hamud Samarra'i now lives in London, from where he heads a recently-formed opposition group, the National Salvation Movement. 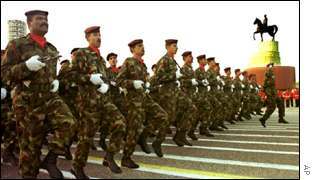 Major-General Samarra'i headed Iraq's General Military Intelligence until his retirement in 1991, following the Gulf War. He then became director-general of Saddam's presidential office. In November 1994 Mr Samarra'i defected by walking for 30 hours from the northern Iraqi city of Kirkuk into the region's Kurdish enclave. In a 1995 radio interview, he cited the Iraqi leader's "injustice, personal behaviour" and "tyranny" as prompting his action. From the Kurdish enclave, Mr Samarra'i attempted to organise a rebellion with the help of the Iraqi National Congress (INC) - an umbrella organisation of opposition groups - and American CIA operatives. The plan was to attack Iraqi military forces stationed near the Kurdish zone with the aim of fomenting a wave of military revolts. Despite what Mr Samarra'i described as "brilliant" military successes, and the defections of hundreds of Iraqi soldiers, the planned mass rebellion did not happen. He broke with the INC and left northern Iraq. In 1995 Mr Samarra'i became leader of the Iraqi National Movement, an opposition organisation dedicated to toppling Saddam. He lived in Jordan and Syria and by 1998 was reported to be based in London. Some reports have implicated Iraq's military intelligence forces in the deadly chemical weapon attacks on Iraqi Kurds in 1988. In June 2002 Kurdish campaigners called for Mr Samarra'i to be tried as a war criminal. He has occasionally been mentioned as a possible candidate for a post-Saddam Iraqi leadership. In 1998 he was mooted as industry minister in a government-in-exile. His National Salvation Movement advocates a democratic government for Iraq and the upholding of Kurdish "legitimate options" within a united Iraq. During his years in exile Samarra'i has often spoken of the Iraqi regime's military capabilities, its weapons stocks and intelligence network. He has been generally supportive of US-British-led air strikes, but has also warned of the dangers of using major military force to oust Saddam, favouring instead "scientific and rational" ways of changing the regime.